Long lasting brass tokens are perfect for video games, batting cages, parking, self-service carwashes, laundromats and amusement operations. 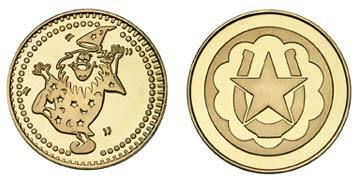 These brass 0.900" Wizard/Horseshoe Star stock tokens are on the shelf and ready to ship in 1-2 business days. You can order as few as 1,000. Click the Buy Now button or Pricing button below for more information.